The October 17-18 issue of The Memphis News reported that the Tennessee Department of Education has been awarded a $3.4 million grant for its special education students. The grant will be distributed over the next four years and will go toward increasing literary and math skills and improving early childhood outcomes for children diagnosed with autism. The grant will also go toward making sure that children from low income families are taught by experienced and qualified teachers. This is great news for Tennessee's students! About a month ago, we blogged about the possible elimination of the Tennnessee Family Support Program. Fortunately, the issue is getting some media attention. WSMV-TV of Nashville reported on the state's budget crisis and what it could mean for funding for people with severe disabilities. Mary Hildebrand of The Arc of Davidson County speaks in the video about how the funding cuts would affect the over 4,300 families who are served by the program. The video also features a family (Courtney Weaver and her mother, Theresa Smith) who benefits from the funds, putting a face to this critical issue. You can learn more about the Family Support Program here. Also, if you haven't already, join the Tennessee Family Support Alliance which brings awareness to the Family Support crisis and provides updates as well as information about legislators you can contact in your area. A story came out on the ABC affiliate in Houston about a boy with autism who saved his art teacher's life. They were in a classroom alone when his teacher, Sheri Lowe, bit into an apple and choked. Ten year old Kyle Forbes then rushed to her and performed the Heimlich maneuver that he learned in Cub Scouts and had practiced with his father. 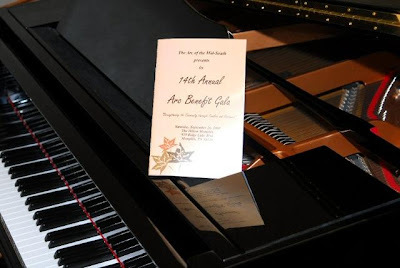 Thanks to everyone for making the 14th Annual Arc Benefit Gala a night to remember. Nearly 300 guests entered the Hilton Memphis’ Grand Ballroom September 26 to enjoy food, entertainment, and music, all for a good cause. The event featured a silent and live auction. Some of the items up for bid included a 47” Philips HDTV from Sam’s Club, roundtrip tickets from Southwest Airlines and AirTran Airways, a membership to The Crescent Club, and a John Hardy cocktail ring from Mednikow Jewelers. Joe Birch of WMC-TV did an awesome job moderating the event and serving as celebrity auctioneer. Thanks to our volunteers, staff, and all attendees! Make sure to check out photos from the gala on our flickr page! October is National Disability Employment Awareness Month and The Arc of the Mid-South will join community groups throughout the area to promote employment for individuals with developmental and intellectual disabilities. Triangle, Inc. is an organization that offers job training and career placement on the east coast. They posted a great video on their Ablevision website that shows a story about a Walgreens employee, Quang, who has a disability and describes his experiences working as a service clerk. The short film is part of a series that can be found on the Triangle website.